" NC GOP Joins FL in Firing RNC's Romney-Tied Voter Registration Firm Accused of Fraud	"
The North Carolina Republican Party has fired the shady voter registration firm owned by Mitt Romney's paid political consultant and longtime GOP operative, Nathan Sproul. The firing came as Democrats in the state were on the brink of denouncing the Republicans' tie to the operative's firm. The state GOP joins the Republican Party of Florida, which also fired Sproul's company (who accounted for the party's largest 2012 expenditure, some $1.3 million over the last two months) after more than 100 apparently fraudulent voter registration forms were turned over to the FL State Attorney in Palm Beach County on Monday for investigation. The BRAD BLOG first reported the emerging story in detail on Tuesday. The firm, Strategic Allied Consulting, is the latest creation of Sproul, a longtime, high-level GOP operative whose companies --- including Sproul & Associates and Lincoln Strategy Group --- have been accused of destroying Democratic voter registration forms and changing information on them in election after election, in state after state, year after year. He was hired for similar operations by Bush/Cheney in '04, by McCain/Palin in '08 and by Mitt Romney's campaign late last year. When the FL GOP fired Strategic Allied on Tuesday night, they noted that the firm had been hired "at the request of" the Republican National Committee. On Wednesday, during our exclusive interview with the Palm Beach County Supervisor of Election Susan Bucher, she described some of the "similarities in the signatures and certain characteristics in the applications that were very disturbing" on registration applications collected by Sproul's firm and turned in to her office. Among the "disturbing" defects on the forms, addresses of existing registered voters changed "to commercial buildings or addresses" and, "in some places, they were changing political parties." Bucher stressed her concern that voters were likely to be disenfranchised by the effort when showing up at the polls on Election Day, only to find their address has been changed, removed or moved to another precinct entirely. The firm is still said to be operating in key battleground states like Virginia, Nevada and Colorado, where a young lady who may have been working for the contractor was caught on a disturbing viral video tape published over the weekend. The young lady, who was hired by "a third-party contractor" retained by the Colorado State Republican Party, as their Communications Director confirmed to The BRAD BLOG on Wednesday, is seen on the tape asking a potential registrant whether she would vote for Obama or Romney before she would allow her to fill out a voter registration form. Mark Binker at North Carolina's WRAL is reporting today that NC GOP spokesman Rob Lockwood says, "The NCGOP takes any threat to the voting process very seriously. We have terminated our relationship with Strategic Allied Consultants." The spokesman also added that the state GOP claims to have no other vendor doing similar work in the state. North Carolina Republicans have spared no time or expense in their efforts to limit democracy and keep North Carolinians out of the democratic process. North Carolina is fortunate that Democrats fought against GOP efforts to pass discriminatory voter ID laws. Now Republicans are using this unethical and shady firm to try to get a leg up in this election ... I am calling on the North Carolina Republican Party to denounce this group and their shameful tactics and to immediately fire this firm. 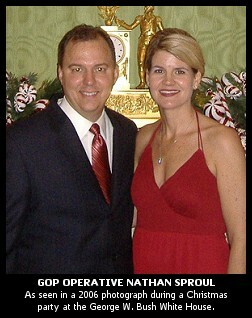 On Tuesday night, The Nation's Lee Fang confirmed the company's operations on behalf of Republicans in Colorado, and unearthed a photo of Sproul and his wife taken at the George W. Bush White House during a Christmas party in 2006. Moreover, a Twitter user directed us to evidence that the firm is also operating in San Diego. Earlier this year, thousands of fraudulent voter registrations were turned into the Sacramento County, GOP in a $50,000 bounty scheme for Republican-only voter registrations. We have not yet been able to tie that scheme to Sproul's efforts. Finally, for those who are just coming to this story, before you bother to equate Sproul's dirty work to anything a handful of ACORN's voter registration were accused (by ACORN!) of doing over the years, please read our original report on this matter which details how there is absolutely no comparison between those incidents and the explicit attempts to defraud the electoral system which Sproul's firms have been accused of doing in election after election. As Republican Congressman Chris Cannon noted, he when highlighted just some of the differences in the organizations during a 2009 hearing on voter suppression: "The difference between ACORN and Sproul is that ACORN doesn't throw away or change registration documents after they have been filled out." Though Republicans in FL and NC have now disavowed their relationships to Sproul, the GOP in VA, NV, CO and CA have not. Neither has the Republican National Committee or the Romney Campaign. BREAKING UPDATE: Just after publishing, word comes that the RNC has also now reportedly "cut ties" with Strategic Allied Consulting, as evidence of fraudulent registrations emerge in four six ten counties in FL, including "dead people being registered as new voters" by the GOP firm. The Republican National Committee has fired a controversial consulting firm it was paying millions of dollars to conduct voter registration in five battleground states, NBC News has learned. The move came after the Palm Beach County, Fla., elections supervisor discovered 108 potentially fraudulent registration forms submitted by the GOP consulting firm, including suspected phony signatures and home addresses that matched those of a gas station, a medical building, and a Land Rover automotive dealership. NBC News has learned that four other Florida counties have also reported hundreds of possible fraudulent registration forms submitted by the firm, including apparent dead people being registered as new voters. "We have heard from supervisors in six counties that they have irregularities in voter registration," said Chris Cate, spokesman for the Florida Department of State, which oversees the state's division of elections. He also received a response from the Romney Campaign who claims: " "We used this vendor for signature gathering services during the primary but have not used them since 2011." Moreover, a statement posted to Strategic Allied Consulting's website late today claims the company has "a zero tolerance policy for breaking the law" and says "all questionable cards" were traced "to one individual" who was fired. But Sproul subsequently told Isikoff during a phone interview that "possible fraud in other Florida counties were isolated acts by individuals hired by the firm". See Isikoff's report for more, including details on the dead voters signed up as new registrants by the company. But one note to Isikoff who repeatedly refers to "voter fraud" in his article: There is no known "voter fraud" related to this scandal. This is a form of election fraud known as "voter registration fraud". There are no actual voters involved in this scandal. The voters have been, and are, doing just fine. Please leave them alone. Inappropriate attacks on voters are best left to members of the Republican Party. Thanks. « PREVIOUS STORY "'Green News Report' - September 27, 2012"
"NC GOP Joins FL in Firing RNC's Romney-Tied Voter Registration Firm Accused of Fraud"
If lying is a sin then Mitt Romney’s Magic Mormon Underpants are on FIRE! How can any intelligent American vote for a man clouded in secrecy who habitually bends the truth? Income inequality is endangering the Middle Class and making paupers of us all who don’t have those millions upon millions of dollars. Read more about the role of Romney’s riches in this election and the power of his sacred undergarments at http://dregstudiosart.bl...ic-mormon-underwear.html The working class of our country can’t AFFORD to allow this election to be bought and sold! You guys did notice that with the Division of Elections closed, no enforcement of any kind is going on now that ACORN and League of Women Voters are out of the picture...This is prime for taking over the central tabulators and voting the registered non-voter that Sproul and company have provided to them. They have become masters at accusing others of the very things they are doing. It's to the point that every time they accuse someone of doing something, I want to look behind their curtain. I am a Florida Resident. Now is the time to call in a federal investigation. Rick Scott has his name all over this with the RNC. I thought they would go after Broward County again, instead they spread out all over the State. FL State Atty Peter Antonacci who is supposedly investigating this matter, served as outside counsel for Jeb Bush during the Senate Trial of former Supervisor of Elections Miriam Oliphant, Broward County. The RNC knows it can't win honestly so they pull out the diebold backup plan, stuff the ballot box plan, make up voters and any other dirty old trick they can think of. All the while denying others the right to vote. They should all be charged criminally. Brad, I posted these comments a few days ago". Many people working for Strategic Associated have linked in profiles. Most are young GOPers, and one, from FL, is a recent alumni of the Blackwell/Schafly Leadership Institute. This is clearly a national fraud. Maybe you want to contact or investigate some of these on the ground orchestrators? Is Stivers Staffing available for comment? I am a Florida resident & a registered voter in Palm Beach County, Florida. The voter registration fraud of Strategic Allied Consulting ( SAC) in Palm Beach County is extremely disturbing for a number of reasons & should set off alarm bells for the DNC on the national level. It is still very easy to register to vote in Florida, change one's registration & to vote absentee. SAC were almost certainty doing much more than just submitting questionable new Republican applications. I strongly suspect they were: 1. Padding Republican registrations w/ the intent of voting these phantom registrants absentee; 2. Democratic registrations are being edited & amended for absentee ballots to be sent to either non-existent addresses or, worse yet, to addresses where the Democrats ballot will be filled out for Romney & be returned; 3. Each SAC strategy floated & tested in Palm Beach County ( a Democrat County) I believe is merely the tip of the iceberg. I believe thebPBCounty effort was just a test. The serious efforts at mis-registering & bogus registering & "Slam" registrations I believe will be aimed at the more conservative districts in Florida : Orlando, Tampa, St. Pete, Jacksonville, Daytona. Between Scott's efforts to purge the voting rolls of Obama votes, additional ID requirements to vote ( vote only at the polls- not absentee), & thousands of bogus registrations & dirty voter suppression tricks, Florida is the national battleground over which voter will be fought. The termination of the RNC's contractual relationship with Strategic Allied Consulting does not necessarily carry with it a severing of its relationship with Sproul. There was one critical piece of public information passed on by Palm Beach County Supervisor of Elections, Susan Bucher, when she was interviewed by Brad during last Wednesday's airing of The Bradcast on KPFK. If you have recently registered to vote, you should check your registration status on-line to make sure you are registered and that your information on the voter roll is accurate. In fact, it's not a bad idea for everyone to check their status well in advance of the election. TIME FOR VOTER ID!!! You just made a great case FOR it as such a simple solution. Voter ID's can be done at the time of REGISTRATION for free. Nathan Sproul and each of the organizations he has run over the past few election cycles are obviously actively engaged in voter fraud. They either destroy democratic registration forms, alter them to appear as republican forms, or alter them to completely disenfranchise the democratic voters. I imagine when the switch the forms to republican they're doing it to inflate the numbers of registered republicans so that when they engage in actual vote rigging on election day, the numbers don't seem so out of sync. Just a theory, but considering how devoted these guys are to rigging elections, nothing they do would surprise me. Oh, "Pro Voter ID", thanks so much for proving once again that ideological partisans are impervious to facts --- hilariously, you guys are such slaves to ideology that you actually pick up the hammer to chip away at your own constitutional rights. So please explain: how would a photo ID restriction at the polls prevent the felony voter registration fraud perpetrated by the RNC's voter registration firm? How would photo ID restrictions at the polling place help legal voters showing up to vote with the required photo ID only to find that because the RNC's voter registration firm put a fraudulent address on their registration, they are prohibited from voting at all? Should the voter then be arrested for felony voter fraud? Do tell. They're all crooks in the republican party. They know they can't win a fair election just like they know they don't pay their fair share of taxes. The Federal Govt. should investigate this voter fraud immediately!!! Lock'em all up if found to be involved, every one of them. This is treason against the U.S. And they're the ones crying voter fraud....really dumb!!!!!!!! !